We are thrilled to have been mentioned in a recent New York Times article titled “On This Oregon Trail, Pioneers Embrace Organic Wine”. Here’s an excerpt from the article, with link to full artile at the bottom. “…Innovators include a winery and tasting room called the Carlton Winemakers Studio. It is the country’s first green-built cooperative winery, using natural light, recycled materials and as little electricity as possible, among other improvements. Ten independent small-batch wineries can share space at one time, and the studio has acted as an incubator for young, talented winemakers without a home. 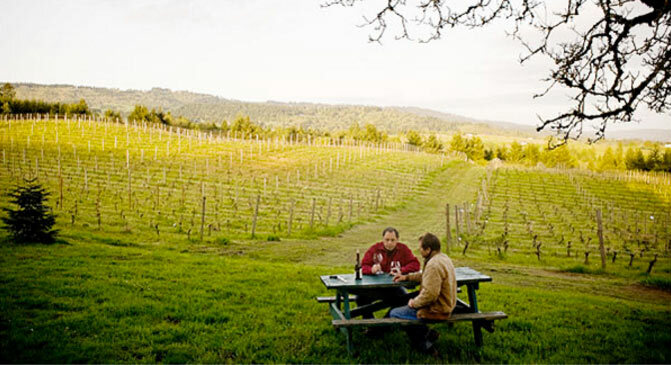 About 20 winemakers have come through since the studio opened in 2002. And like many wineries along this laid-back and friendly wine trail, it’s also the kind of intimate place where you can run into your favorite winemaker while sampling flights. On a recent visit, my friend Sarah and I watched as the tasting room manager introduced two Portland fans of the winemaker Andrew Rich to the man himself, who happened to be the guest winemaker on duty. “Everyone’s wines are featured on a rotating basis here in the tasting room,” said Mr. Rich, who poured a pinot noir flight that included creations by several different winemakers. We tasted Mr. Rich’s own flagship blend, the Andrew Rich Vintner 2006 Willamette Valley Pinot Noir, an earthy, berry-rich wine. Carlton Winemakers Studio has also begun a program of wine education classes taught by in-house vintners; topics range from subappellations of the Willamette Valley to sustainability in the vineyard. What is The Carlton Winemakers Studio?